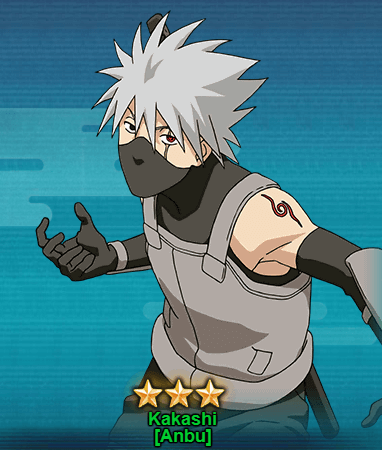 Kakashi [Anbu] is the new character added to Naruto Online game today on 29th of March 2018. I’ve not covered other Kakashi ninja characters in this website. We will move on with Kakashi[Anbu] first. Taijutsu & Ninjutsu Lightning Style – Double Lightning Cut [Prompt]: Causes Lightning attribute damage and Paralysis to a line of units from the opponent’s formation, a selected nit will also suffer from Repulse. Taijutsu Sword Tactics – Thrust: Attacks the opponent’s unit with the least Life points and has chance of causing Knockdown. Taijutsu Sword Tactics – Slash: Chases and Attacks a Repulsed unit, causes High Float. Can be triggered up to 3 times each round. Taijutsu Cold Blooded – Cut Throat: Causes 30% extra damage to Non-Konoha ninja and causes Acupuncture to this unit when this unit lands a Critical Hit. As you can see Kakashi [Anbu] was just introduced and only available in the Wheel of Fortune event. Kakashi might be available in other events in future. I will keep you updated if there are any other ways to get Kakashi [Anbu] in future.